Without enough meters to measure flow in pipes, how can you monitor flow in existing pipes in preparation for upgrading work? Michael Farnon of Micronics has a solution based on a lot of practical experience. Trying to get a grip on the energy flows within the hydronic systems of building services and the potable water and DHWS (domestic hot water services) consumption can be a daunting task. They are the questions to be answered. Starting with a clean sheet would be great, but in practice we’re faced with old systems, limited drawings and a confusing and tangled mess to sort out. And when we think we’ve established the circuit or area to be investigated how are we going to measure what’s going on? The conventional solution is to install in-line meters, but we’re not sure we want to invest in the considerable cost of installing a fixed or permanent solution or face the disruption associated with draining down systems, cutting pipes and so on. Ideally we need a quick solution, which is cost-effective and involves minimal disruption. The answer is clamp-on ultrasonic flow and energy meters, which are available as portable instruments for temporary investigations or fixed meters for longer-term measurement and monitoring, as a direct alternative to conventional in-line meters. Clamp-on ultrasonic metering is a best-value, minimum-disruption solution for retrofit of building services in existing buildings with no drain-down or cutting of pipe-work, delivering a quick and lower-cost installation. There are ongoing benefits, including dry servicing with minimum down time and interruption of building services. So if you need to find out what’s flowing where to manage energy or control billing of energy or water consumption, this is the tool for the job, which is easy to install and integrate with aM&T and/or BEMs systems. Ultrasonic flow meters lend themselves to temporary and permanent installations. For example, consultants might use clamp-on flow measurement in sustainable water-treatment projects. Another possibility is surveying existing large-scale heating and HWS installations to establish a basis for installing improvements. This can be a daunting task, but Environmental Treatment Concepts (ETC) has found that a portable clamp-on flow meter is an ideal tool for the job. ETC technical services manager Simon Elliot says, ‘The PF330 [a Micronics device] has proved to be a great tool to undertake plant surveys — including identification of circulation shortfalls and even pumps going backwards. It provides a real insight into what’s going on, like having X-ray vision. And it’s also a valuable tool for demonstrating how well our installations work to improve performance and reduce energy consumption. We’ve got a lot of public-sector — MOD and hospital — installations with very old pipework where we’ve been pleased with the product performance, and the ongoing service support has been there when we’ve needed it. Clamp-on flow meters provided vital decision-making evidence in a large school in Dagenham When this secondary school was planning an extension, existing energy usage needed to be precisely monitored to determine whether there was a requirement for additional boiler capacity. Furthermore, the school’s small boiler room could not have accommodated a larger boiler, so construction work, time delays and expense would have been incurred if the usual practice of selecting a boiler based on paper calculations had been used. The school called in The Energy Practice, an energy- and low-carbon consultancy business, for advice. Director Robert Reeves, a mechanical designer, looked around for a solution and chose a portable clamp-on flow meter, the Micronics Portaflow 220. 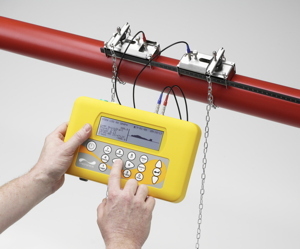 This ultrasonic flow meter simply clamps onto a closed pipe. Its non-invasive nature means no interruption to everyday activity and no downtime, meaning the school could carry on its activities unhindered whilst the unit was installed. Managers at an acute, district general hospital in north and mid Bedfordshire, wanted to understand their consumption of hot water, which would in turn allow them to identify the requirements for replacing their equipment with the most energy-efficient solution. They called in ETA Energy Systems, Bedford-based consultants, designers and suppliers of specialised energy equipment and systems, which works with the Carbon Trust to reduce energy usage. ETA specialise in determining that pumps, flow-rates and balancing valves are correctly set. Managing director Peter Richardson explains, ‘During our assessment of the hospital’s needs, we established full weekly hot-water-consumption profiles, allowing equipment to be accurately selected and specified for the replacement project. 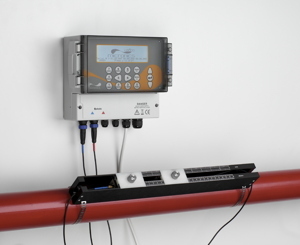 Having considered various measurement alternatives, two PF330 meters were selected due to the ease of installation and the maintenance and service benefits delivered by this non-contact technology.’ The non-invasive measurement represented significant savings on installation costs and less disruption than installing alternative in-line meters. Fixed clamp-on meters provided a solution for university when Manchester University’s estates department was faced with a problem. Three newly built blocks, including a large lecture theatre and reading rooms, had insufficient metering. Shutting down each system and draining it each time would have been time consuming, making it costly to undertake any repairs. Assistant mechanical and energy engineer Chris Cunningham had used Micronics U2000 and 3000 fixed clamp-on flow meters previously and knew that they were easy to install and, above all, allowed simple, low-cost measurement without the need to cut into the pipe. He was confident that a Micronics product could solve the problem. This time, an Ultraflo U1000, a permanent/fixed clamp-on flow-metering solution for measuring preset flow rate was specified. There are considerable opportunities to use ultrasonic clamp-on products to provide quick-fix solutions in the pursuit of better management and reduction in the consumption of energy and water within the hydronic systems of building services, potable water and domestic-hot-water services. Michael Farnon is managing director of Micronics.